This bundle consists of my Early Finisher PPT, center cards to print, and worksheets that can be used for homework, seat work, or extra practice! This resource is an EARLY FINISHER activity. As students complete work, you can have this projected onto your whiteboard. The slide shows a picture with SIX different CHOICES. 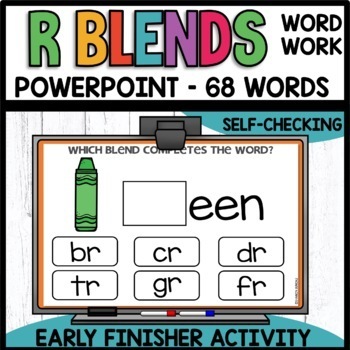 Students write the R BLEND they think completes the word on their white board. Then the correct answer is shown in 10 seconds - then it automatically goes to the next slide. ALL YOU HAVE TO DO IS PRESS PRESENT! Super easy and the kids ❤️ this! ★CUSTOMER TIPS:How to get TPT credit ($$$) to use on future purchases: • Please go to your My Purchases page (you may need to login). Beside each purchase you'll see a Provide Feedback button. Simply click it and you will be taken to a page where you can give a quick rating and leave a short comment for the product. I value your feedback greatly as it helps me determine which products are most valuable for your classroom so I can create more for you. Be the first to know about my new discounts, freebies and product launches: • Look for the STAR near the top of any page within my store and click it to become a follower. You will now receive customized email updates about my store.